Spirits of Mystery: Illusions Collector's Edition is rated 3.0 out of 5 by 24. Rated 5 out of 5 by BooksandGameFan from Best Spirits of Mystery Yet! I just finished playing the entire game and the bonus and I have to say I really, really enjoyed this game. I love ERS because they are almost always straightforward and logical and you aren't running all over the place trying find things that have been so well hidden it becomes frustrating. You do go looking for tons of stuff before the story moves along this game moves along very nicely. There's some back and forth but not near as much as many of the other games, which is also a plus. I own all the games in this series and I've enjoyed them all. They do seem to stay true to the story as it's progressed and in this game, you find out something that makes the story even better if you purchase the CE and play the bonus game. 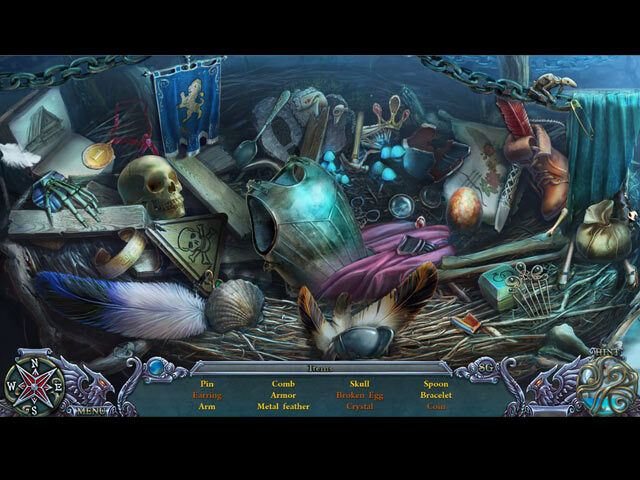 I found this game to be great fun, I enjoyed the mini games and all the interactive hidden object scenes. I highly recommend this game. Rated 5 out of 5 by Queen1994 from Last I checked I'm the Fire Queen I loved playing this game, the puzzles were challenging, the story line had an unexpected twist, and I got to play as a princess and defeat Mortis again (this time for good I hope). Rated 5 out of 5 by Frezo from Love this Game I really Love this Fantasy Game and this sequel, nice graphic, nice story line. I know it is not everyones cup of tea, but sure it's mine cup of tea. I like to dive into fantasy games and to forget the world around me. Wouldn't it be nice, to be a princess? Thank you very much, so happy to play it. Rated 5 out of 5 by MaryCricket from Time to save your Kindgom This was a really an enjoyable game to play, love collecting puzzle pieces, Finding the morphing was easy. I liked the option of choosing hard or easy in the mini games.. The only time there is talking is when you rescue the victims, I loved the sound effects. The only thing I did not like about it, it was a bit short. But as a whole, I loved the game. Rated 5 out of 5 by undertaker54 from Spirits Of Mystery ILLusions CE Awesome graphics great story telling. Must play. Rated 5 out of 5 by biscuitsmama from CAN YOU FULFILL THE PROPHECY AND DEFEAT MORTIS? Queen Mortis is on a rampage and must capture you, the Princess of the Fire Kingdom, so that she can take back what she believes is “hers’ and become the ultimate ruler over all the kingdoms. Of course, to accomplish her goal she requires the help of the mage Isa who is under a spell with no will except to serve his queen. Now it is up to you, princess, to save your kingdom. As your first task “Nanny” says you must go to the Shield Shrine and activate the Magic Shield that will protect your kingdom. Nanny gives you a sealed case containing a Magic Bow and a note from your deceased father telling you that it now belongs to you. With Magic Bow in hand you activate the shield. You soon learn that you are the one who will fulfill an ancient prophecy to defeat evil and restore the kingdoms. As you move out of the palace you are confronted by an illusion monster that unknowingly opens a portal that captures Nanny. Now your adventure begins in earnest as you must save Nanny as well as your kingdom. As always, the graphics in ERS games are excellent. I love the Spirits of Mystery series because the games are generally full of beautiful scenes even though at times they may seem a bit dark. I’m a huge fan of hand-drawn artwork rather than the newer, highly polished computer graphics that we see so much of now. The characters created by this artistic team are the best and seem to come to life as I play their games. In Spirits of Mystery: Illusions your tools include a transporter type map as well as a Magic Bow. Of course you do have another gimmick – a Magic Mirror that will help you dispel Queen Mortis’ illusions. The Magic Mirror is a gimmick that I happen to like and isn’t one that annoys me. The HOP scenes are nothing new as they are basically the developers spin on the ones that BFG determines should be in all HOPA games. Then there are the puzzles that are basically the same in all games from the ERS team. In the demo they were very easy but, that being said, I always enjoy their puzzles except for some of the toggle type. In my experience the puzzles do become more difficult as the game progresses. 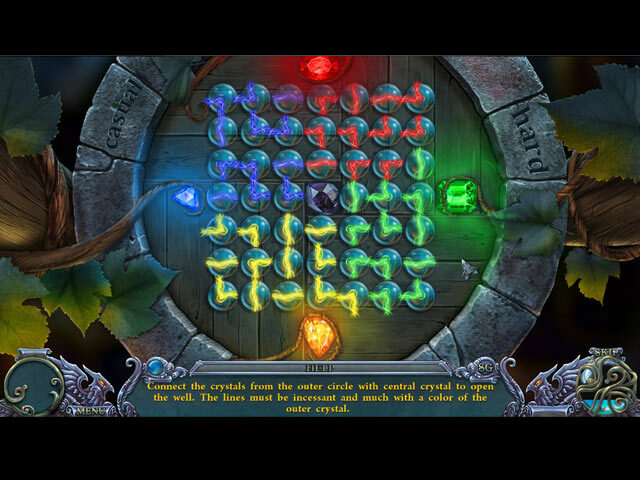 The CE version of the game includes morphing objects and collectible puzzle pieces that are hidden in each scene. There are achievements to earn as well as the standard extras including a strategy guide and bonus game. IMHO, this is a great CE package as it has far more extras than those normally found in games from this developer. The Spirits of Mystery series has become one of my favorites over the years and I own every CE game in the series. I have almost always enjoyed the storylines and find this new one intriguing. Even though the puzzles are not difficult I do enjoy them as well as the HOP scenes. The standard list type HOPS have always been the ones I enjoy the most and they are what attracted me to HOPA games years ago. I know many gamers who have been playing HOPA games for years might not enjoy the game as much as me because they are perhaps a bit tired of what they think is the same old thing. There really does become a point in time were many series become stale and for some Spirits of Mystery might be one of those series. However, for me it is a series I still enjoy and Spirits of Mystery: Illusions is an instant buy for me. Even though I know this is a game I will love, please try the demo to see if this is a game you will enjoy as well. Happy gaming! Rated 5 out of 5 by Sara6777 from ERS Did a Great Job With this Game! I'm usually not an ERS fan, but this game is changing my view and giving me hope! FYI...I only played a few scenes....as a reference for my review. The collectibles make this game a purchase, for me.I'm always a fan of a good morphing object...and this game has 32 of them! The only negative being that they object the item morphs into is the same in each scene, and colorful. So...once it morphs, it does stand out as the MO. The puzzle pieces are well done, too. I didn't get very far into the story line, but so far it seems to work. The graphics are a bit blurry, IMHO...but must be how the Devs intended. Technology is too far advanced for it to be otherwise. As always, try the demo for yourslf! 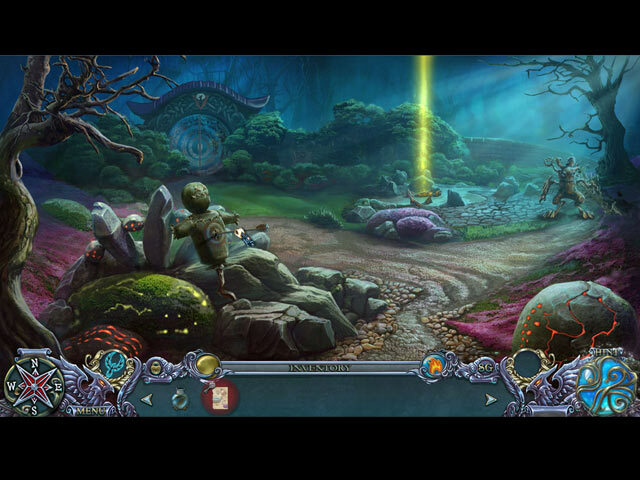 Rated 5 out of 5 by LogieBaby from Spirits of Mystery returns ti its past glory When this saga first began to unfold a few years ago, the initial couple of games were a breath of fresh air. Unfortunately said air became stale with subsequent installments and this series like so many others suffered possibly due to oversaturation. I am pleased to report that Illusions has returned S of M to the glory stage. The premise is one used way too often, In this case the evil queen Mortis has captured princesses and by abducting the Fire Princess ( that's us ) she will succeed in becoming an all powerful being. Mortis is presumably assisted by Isa who must be part cat himself as well as being accompanied by his panther since Isa never gets beaten down for long. At the end of this demo Isa apparently turns on Mortis to pursue his own nefarious intentions. So much for the story line. As to the Illusions themselves they are creatures which when subdues become human. These folks must then have certain objects returned to them so that they can provide items which are vital to the Fire Princess in her adventure. I liked the chain removal task while avoiding contact with floating things to defeat the creatures. It is a clever devise not often seen in games. Illusions includes lots of gatherings in order to assemble other items and the player needs a good pair of shoes as there is lots of to and fro required to complete the tasks. The hidden object segments are nothing special, they include traditional word lists, silhouettes, etc. One of the puzzles demanding the proper placement of cubes on a pictured grid is clever. The collectible lovers have jigsaw pieces and a triangular item to find. While the game really breaks no new ground in the HOPA world the use of not often used devices makes this installment of S of M a cut above what we have been given thus far in 2017. Rated 4 out of 5 by marfa923 from Spirits of Mystery Returns....... This is on the Demo only: I really like this game. It is fairly easy, I played on casual., but I like it. I like the colors, the familiar characters, the Princess having to be the one to save every one and her kingdom. I think you have to try it for yourself. If you're looking for a big challenge, maybe try it at a harder lever, but it doesn't seem to me that this one would be to hard at any level. Sometimes it's just nice to play an easy fun game. I like what I've seen so far and will buy it when it goes on sale!! !